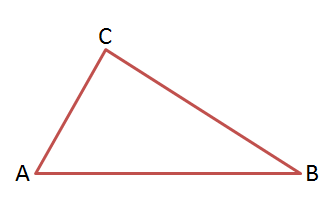 In the previous post, we proved that if the two sides of a triangle are not congruent, then the angles opposite to these sides are also not congruent. In addition, we have shown that the angle opposite to the longer side is the larger angle. In this post, we continue with the converse of this theorem. We show that if two angles of a triangle are not congruent, then the sides opposite to these angles are not congruent. Also, the side opposite to the larger angle is the longer side. This is evident as shown in the figure above. As we can see, is the largest angle and , the side opposite to it is also the longest side. Therefore, we show that if then, . In any triangle , if then, . We use proof by contradiction. Assume . Then or . If , then is isosceles and by the Isosceles Triangle Theorem. If , by the previous theorem, . Now, both of these statements contradict the given that . Therefore, the assumption that must be false. So, in any triangle , if then, .